Intrepid advises RSI Home Products on its $1.075 billion sale to American Woodmark Corporation. “We have worked with Jim Freedman for over 20 years and he and his team at Intrepid skillfully helped us negotiate this transaction with American Woodmark. We couldn’t be more excited and optimistic about the future potential for RSI and its loyal employee associates,” said Ron Simon, RSI’s Founder. Intrepid today announced the $1.075 billion sale of its client, RSI Home Products, Inc. (RSI), a leading manufacturer of kitchen and bath cabinetry and home storage products, to American Woodmark Corporation, which manufactures and distributes kitchen cabinets and vanities for the remodeling and new home construction markets. The deal is valued at approximately $1.075 billion comprised of cash, stock and assumed debt. The transaction closed on December 29, 2017. Entrepreneur Ron Simon founded RSI in 1989 to offer high-quality, low-cost, value-based kitchen, bath and home organization products. “RSI has a strong reputation in the industry and is known for delivering quality products and unsurpassed value to customers. We are thrilled to have advised Ron and his team on this exciting merger as we feel it positions RSI to deliver growth and enhance shareholder value,” said Intrepid’s Chairman and Managing Director Jim Freedman. RSI is one of the largest in-stock and value-based cabinet makers in North America providing kitchen, bathroom, home and garage organization cabinetry, countertops and accessories with over 100 styles and finishes to home centers, builders, dealers and remodeling contractors. The company employs more than 4,200 employees and has manufacturing and distribution facilities in California, North Carolina, Texas and Mexico. 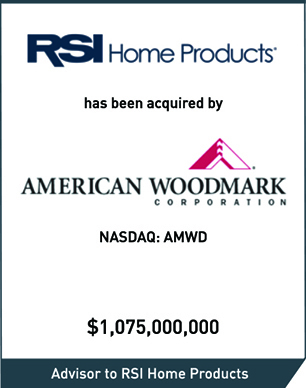 RSI will operate as a subsidiary of American Woodmark following the transaction with its existing brands, channel strategy and operational philosophy remaining. The combined company will be managed by American Woodmark’s management team, which is led by Chairman and CEO Cary Dunston. Jim FreedmanChairman and Managing Director Gary Rabishaw, Managing Director Jeremiah Mann, Managing Director Brian Levin, Vice President We served as the exclusive financial advisor to RSI Home Products.